Rainbow Day Camp is located in El Cerrito, California, and the success of their program may lead to a second location opening in Colorado. The camp welcomes transgender and gender-fluid kids between the ages of four and 12, and it just sounds like a lovely place. 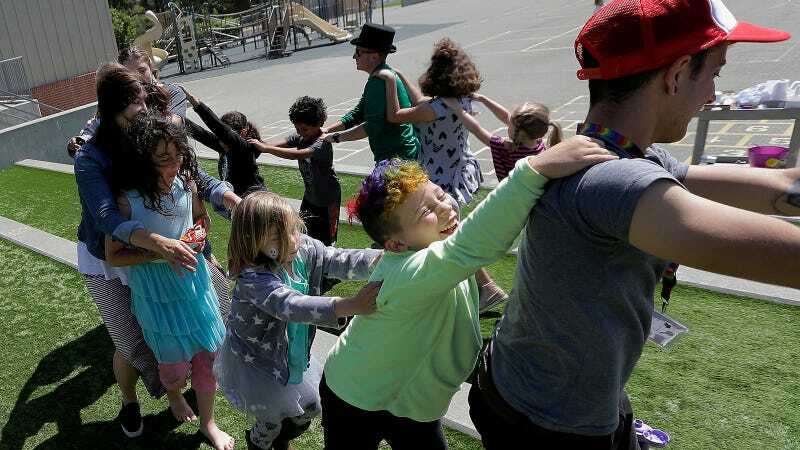 The Associated Press interviewed parents, campers, and counselors about the importance of a place like Rainbow Day Camp and the resulting piece is touching. The camp opened three years ago, and enrollment has tripled since that first summer. Families have been flying their kids into San Francisco just to attend, including some international families. The Maxwells live in the area, which is known for liberal, and were able to find support groups and play groups for their daughter, Gracie. By the time she was four, they’d allowed her to change her name and grow out her hair. The camp’s founder, Sandra Collins, says her daughter knew she was trans at two. She says one day Rainbow Day Camp “won’t be so innovative,” because its success reflects a need. The Colorado branch is being planned for next summer, but they’ve been contacted by organizations in Atlanta, Seattle, Louisiana who want to figure out to set up programs like Rainbow Day Camp’s. There are some good places in the world and you can read more about this one here.